This is our list of Top 3D Printers. Please comment on if we missed some good or bad points. 4.2 Is MakerGear M2 3D Good for Home 3D Printer? As desktop 3D printers take big leaps ahead with product design and sales we do see drop in sales with professional (industrial) 3D printers around the world. Company Aleph Objects is maker of one of the most popular 3D printers. After success of LulzBot TAZ 4 now came improved version: LulzBot TAZ 5. Aleph Objects models are well accepted by professionals and amateurs willing to experiment and make 3D objects for various uses and TAZ 5 will be sold along various selling channels. LulzBot TAZ 5 3D printer is selling for $2,200 and features major improvement over LulzBot TAZ 4 3D printeras PEI surface (for print) with proposition to hold on printed object without need to apply UHO stick on it or tape. Another improvement is its all metal hot end that can work with very high temperatures up to 300 Celsius degrees. Is using filament (bought separately) from LulzBot with many colors and material structure as HIPS $24.95 for 1KG Reel, PLA, ABS, wood, metal and stone-like. Producers of these filaments are companies’ eSun and Fenner Drives and you will be able to purchase directly or from verified suppliers. This 3d Printer is based on libre-free software and hardware so technology advancements are community based and frequent. This model prints quite big objects 298 mm x 275 mm x 250 mm (11.7 in x 10.8 in x 9.8 in) and if you order second-extruder-head you can instantly print with two different colors or two different materials. As software is concerned you will be supplied with open-source Cura LulzBot Edition that supports all operating systems. With Cura LulzBot you will be able to design and process (send) for printing your objects. TAZ 5 3D printer is great with several big improvements over TAZ 4 and it offers professional quality built with awesome choice of filament materials. One strong point in owning it is that it prints its first few layers at very good quality because it has implemented major improvement of its rod feeding system. This improvement means higher precision of prints and less re-prints. It features betterment of its Y-axis, like improved mounts for faster first-time-printing. Power supply is with increased power (400 watts) so its capable of supporting more improvements (higher power consumption parts) in the future (like second plastic extruder head). Cooling fan is included for better printed objects and manual installment is not needed (more payment). Let’s mention again that LutzBot offers upgrade option for second plastic extruder if you need so to print with different color orABS/PLA plastic. Weak point is that open-source software (Pronterface, Slic3r) needs to be re-coded for major improvements. Sure this cannot be accounted for design flaw of the printer itself but its major fall back for user experience for its not possible to design and print great objects with faulty software. TAZ 4 by LulzBot is great 3D printer, solid build, great potential and with major improvements from TAZ 3. If you don’t feel pressed by its bad software go ahead and buy this great piece of hardware. Is MakerGear M2 3D Good for Home 3D Printer? The MakerGear M2 is an exciting 3D printer which looks and prints almost like professional desktop printers do. This printer is major improvement over earlier models of MakerGear and its build on in-house third generation technology. MakerGear M2 is bit pricier for this range of printer but with its characteristics leads the way among other players. This printer offers many great characteristics like very high resolution of printed layers – even 0.01 millimeters or 10 microns (17 µm — minimum width of a strand of human hair). MakerGear M2 can meet high printing speeds since it has steel frame and high-quality elements so you would need strong table to hold it and avoid vibrations. Its frame is firm and computer cut and axis mounts plus bearings are of high quality aluminum too. This printer has few weak points too like bulky dimensions reducing its mobility and price higher than comparable 3D printers. Although this model is over one year old it gets continuous positive ratings among buyers around the world. Positive ratings are not for nothing and mostly come from users that print for commercial purposes and profit. If you plan to use it like a toy we would recommend buying alternative model, but if you plan it to exploit it hard go ahead and buy it. 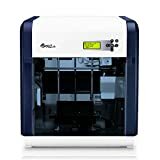 The XYZprinting Da Vinci 1.0 3D Printer is one such 3D printer that is known for the quality, trust and durability. Once you have it in your printing workshop, you will be amazed at the quality of the prints. Its durability will make you appreciate its ability to print for long duration’s continuously and that too with no slack in quality. With this printer, the producer has set an unprecedented milestone in the 3D printing technology. If awards and recognition’s are any indication of acceptance of a product, then you will be glad to know that this printer has been the winner of 2014 CES Editors’ Choice Award Winner-Most Affordable 3D Printer. 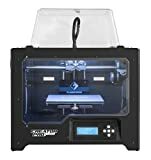 I have searched for a better 3D printer at this price and with this veracity, but was unable to find a better replacement. 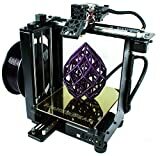 This model is one the best 3d printer for sale. Da Vinci 1.0 3D Printer has the capability to work with design files Via CAD 3-D application and create prints from STL files. The automatic updates take away all your worries regarding the software compatibility and other matters. To show how impressed I am with this amazing printer, here are some of the advantages you would appreciate too. Of course I will list down certain minor issues that may concern your print tasks.